LIGHTSPEED PLANNER is an easier way to prioritize your tasks, set deadlines, write down your goals, and track your progress in minutes. WHY IT WORKS: We bet you are a bit like us. We were tired of planners that took too much of our time and energy, only to feel overwhelmed, frustrated, and less in control of our day. Let's face it, your planner shouldn't be overly complicated and time-consuming. It should be simple and straightforward. 2) Doesn't take too much time or effort. 3) Allows you to focus on what matters most. Our easy 3-step planning process is simple and effective, allowing you to focus on what's important without spreading yourself too thin. We help you break down your three key tasks in order of priority so that you can maximize your time, track your progress, and accomplish your short and long-term goals effectively. A5 Size: 5.7" x 8.3"
Lightspeed Planner gives you the tools you need to achieve your goals and create real change for success. Click the ADD TO CART button now to start planning and work toward achieving your goals today! ✅ STAY ORGANIZED & BOOST PRODUCTIVITY: Our daily planner was designed to help you maximize your time and make you more productive. Lightspeed Planner is an easier way to prioritize your tasks, set deadlines, write down your goals, and track your progress in minutes. ✅ GET FOCUSED & ACCOMPLISH MORE: If you want to boost your productivity, perform at a higher level, and accomplish more, you need to plan your day effectively. Our undated 6-month professional planner helps you do exactly that and more. Lightspeed Planner is easy to use, doesn't take too much time or effort, and allows you to focus on what matters most to get stuff done. ✅ STAY ON TRACK & ACHIEVE YOUR GOALS: Our goal-setting system is just what you need to accomplish your goals & track your progress with ease, without wasting time. A study found that you're 42% more likely to achieve your goals by writing them down. That number increases with a plan of action. Combined with our gratitude list, you'll start to see positive changes in your level of confidence, happiness & overall productivity. ✅ MINIMALIST & HIGH QUALITY: Our professional 3-step planning system comes with notes, blank pages, gratitude lists & goal setting sections. With its durable faux-leather hardcover & 100gsm premium paper, the Lightspeed Planner is compact, convenient, and perfect to bring on-the-go. ✅ SATISFACTION GUARANTEED: Lightspeed Planner gives you the tools you need to achieve your goals and create real change for success. If you don't absolutely love your planner, just return it within 30 days of the date you received it and we'll issue you a refund. 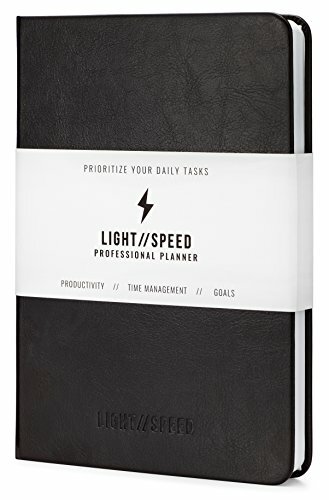 Lightspeed Planner is the perfect gift for business professionals, athletes, artists, entrepreneurs, creators, parents, students, and people who want more control of their daily life. If you have any questions about this product by Lightspeed Planner, contact us by completing and submitting the form below. If you are looking for a specif part number, please include it with your message.